As veterans of the magazine business, we’ve done extensive research over the years, and we know your eyes flicked to that score box down there before they made it up to these words. We also figure you’re probably tutting over a set of cans picking up that sort of score. That’s too low a price for them to be audiophile quality, and too high a price for them to be reasonably affordable, right? Yes. You’re absolutely right. Heck, let’s list some more of their flaws while we re in the mood: The cable’s a touch too short, there’s no built-in mic, the meaningless “Hi-Res Audio” logo is on the box as some kind of enticement for the unaware—the list goes on. But 1More’s remarkable headphones deserve every ounce of praise we can pour on them. Even getting them out of the box is an experience; proper packaging making way for an included carrying case, then the cans themselves—heavy, solid, and pretty damn beautiful, with the correct orientation marked on the inside of each earcup in inch-high letters, so you don’t have to squint for a tiny icon in order to get your stereo orientation straight. The rear portion of the cups is. judging by its perfectly striated pattern, milled straight out of anodized aluminum, and it’s far from the only metal component on display. While there is plastic, it’s used as a complement rather than a structural centerpoint. 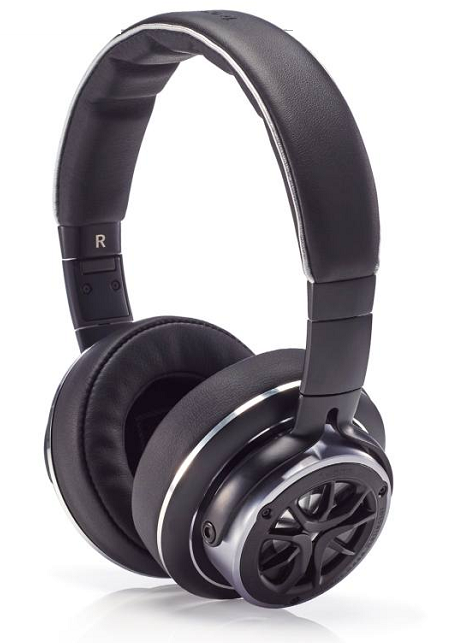 The headband is stainless steel, the earcup pivots are metal, and fold inward with a solid clunk when it’s time to stow them; these are headphones that are built to last. And what sound. 1More’s marketing trumpets triple drivers in the form of a 40mm graphene dynamic driver, a ceramic tweeter, and a bass reflector. That last one is, technically, a bit of a fudge: Bass reflectors aren’t really active drivers, more tuned ports or, in this case, a cunningly constructed membrane placed behind the main driver, and behind the transparent window on the cans’ outer shell. But 1More has clearly got the hang of the tuning part of things inside these closed-back enclosures. The sound stage is wide; it’s woody, crisp, subtle, and brash in equal measure, leaving everything from top to bottom distinct and definable. There’s great separation on offer, and while the output isn’t completely flat (getting a little pushy toward the bass end. and often very bright on the treble), it’s very pleasant. Transformative, even—it could change the way you listen to music. Games aren’t the 1MEJH0006’s wheelhouse, given the lack of mic, but that acute frequency distinction makes them a great choice if you need to keep your ears on your environment.